After one full official day of GABF 2015 I already feel a little worn around the edges. Being somewhat impatient and mildly agoraphobic doesn’t lend itself well to attending festivals full of drunk people, but what’s a little discomfort when it comes to trying beer from diverse parts of the US you might not otherwise visit? Although I will probably try to condense my GABF experiences into a summary of some sort at a later date, today I am thinking more about some of the trends I see among the growing craft beer crazed people now caught up in the “scene”. One recurring topic making the rounds in social media and even legitimate publishing circles involves the specter of corporate takeover. 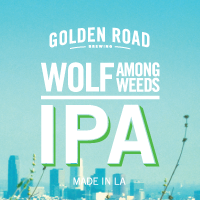 From Goose Island several years ago to Elysian, 10 Barrel, Firestone Walker and now Golden Road, there are huge segments of the beer community running scared. How can the owners of these breweries “sell-out”? What will happen to “craft beer” when the big guys buy up all of these smaller companies? All of the lamenting strikes a bit of a nerve to be honest because any objective outsider not wrapped up in sentimental idealism knows the very simple precept that answers all of the questions surrounding these deals – breweries are businesses. What do we call people that own breweries that aren’t profit motivated? Homebrewers! You might have an emotional attachment to a commercial brewery and so might the owners, but anyone that starts a business wants to make a profit and whether they think about it early or sometime down the road, every business owner eventually comes up with an exit strategy, a scenario in which they get out of the business or relinquish a part of it to enjoy the fruits of their labor. In some cases their new partnerships also allows their brand to expand well beyond their original target region which probably has its own appeal. Breweries are manufacturers, often making the same products over and over and over again. The huge number of people whining on Facebook about corporate takeovers indicates there are a lot of “craft enthusiasts” out there that know little about owning a business much less a manufacturing enterprise. Don’t be surprised when established regional breweries do something unexpected, that’s how business works. When St Arnold says they will never sell outside of Texas and then do so several years later as their capacity grows, or when New Glarus says the same thing about staying only in Wisconsin and then inks a deal to move into Illinois…it’s not personal, it’s business and growth often requires making changes. At the moment the BA says new breweries in the US have topped the 4,000 mark and only a small fraction are now corporate owned. The current rate of brewery growth is unprecedented, so there is no need to worry about InBev gobbling up a few established regional brands. I still believe we are on the cusp of saturation in some markets which will limit the growth of distribution oriented breweries, although there will always be exceptions among those with a niche or an established presence in some markets. Otherwise I think the next decade will usher in the rise of the brewpubs which subsist mainly on the business from local patrons. If Portland and Denver are rough guides, this is the way we are heading in my humble opinion. Cheers from GABF! Please excuse my long absence, but to be honest at times I get a little weary of it all. I once enjoyed pontificating about beer but these days the beer world is generating so much attention from those seeking to make a name for themselves in this ever expanding universe it genuinely makes me want to crawl in a dark hole. However, every now and then I come across something that prompts me to put pen to paper once again. Whenever I see stories about established breweries entering into out of state distribution deals it always gives me reason to pause and reflect upon what I see as the inevitable reckoning awaiting US “craft” breweries. It’s difficult being the pessimist sometimes, but we have enough cheerleaders to drown out the lamentations of those like me that predict another paradigm shift is on the horizon. This isn’t the first time we have focused on the inevitable saturation of the US craft beer market. As distribution channels open across the country and “craft” breweries undertake massive expansions the signs are there regardless of the rosy predictions from the Brewers Association. You see it when Upslope sends beer to Texas or St Arnold sends beer to Colorado. It’s the uneasy feeling you get when New Glarus declares it will sell into Illinois after years of using the “Wisconsin Only” tag as a marketing hallmark. From massive planned expansions at old stalwarts like Anchor to unprecedented growth at regional breweries like Ballast Point and Great Divide or Breckenridge, as breweries expand to secure an increasingly finite piece of the consumer pie they find themselves needing to look beyond their traditional markets in order to maintain their economy of scale and justify production. Simply look at how many have entered into out of state distribution arrangements or the growth of contract brewing operations. All of this came to mind when we visited Breckenridge recently and I read a local paper that contained an article about Backcountry in Frisco, a packaging brewpub opened in 1996. According to the article owner Charlie Eazor recently entered into a deal to begin distributing in Texas starting with Dallas and Forth Worth through Full Jacket Distribution. 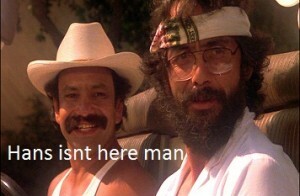 He was quoted as saying “In Colorado we’re another Colorado beer fighting for shelf space with 200 other Colorado beers. In Texas we’re a Colorado beer fighting for shelf space with the unique fact that we’re a Colorado beer”. Apparently they will start with placement in Whole Foods, Specs, Trader Joes and Krogers. Was this a sincere effort based on sound market research? Certainly the first part of his quote indicates their growth prospects within Colorado are limited. A quick search at www.specsonline.com and you find over 200 12oz examples of just Texas craft beer and about 350 “craft” bottles. I like Backcountry’s beers but I for one am not so certain being a “Colorado beer” is something unique enough to set it apart in Texas…but what do I know. A mantra within homebrewing circles suggests “making beer is easy, but making great beer is difficult”. Not to contradict conventional wisdom, but you can make great beer fairly easily that far surpasses that found at your local bar or liquor store. Let no one including commercial brewers convince you otherwise – YOU CAN MAKE AS GOOD OR BETTER BEER AS ANY COMMERCIAL BREWERY. The same could not be said in the distant past when homebrewers scrounged for cans of imported liquid malt extract that was often well past its prime, or dry yeast packets stored at dubious temperatures. Today we can get the exact ingredients used by professional breweries and brewpubs. The amount of information available to homebrewers also means some people making beer in their homes are now more technically adept than many commercial counterparts. Equally important, advancements in homebrewing equipment and brewing techniques now means some homebrewers can use the exact same scaled down versions of what you might see at many breweries and brewpubs. But then again, homebrewers aren’t as constrained when it comes to the process. They are limited only by their imagination. 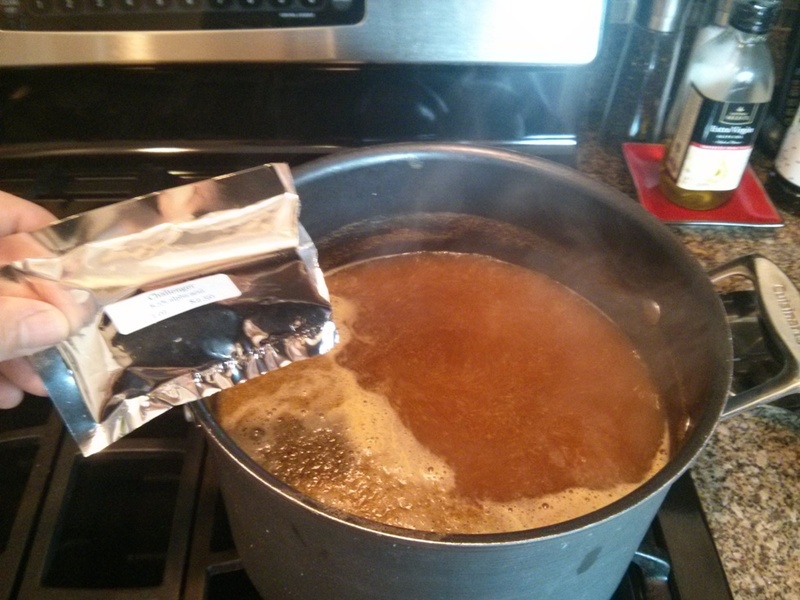 Making exceedingly small batches of beer allows one to take chances. For the remainder of this diatribe I will assume the reader has some knowledge about homebrewing basics and most steps will be covered in a concise way. Like many others we normally make beer using a somewhat bulky all-grain system, although time and space limitations required a different approach at times which I wanted to share. 3. After 60 minutes heat 1 quart (Beersmith calls for 37 oz) of filtered water in a separate pan or a tea kettle to 170F, uncover the pot containing the grain and slowly raise the bag of grain to insert a colander or large strainer under it and allow the bag to spread out. 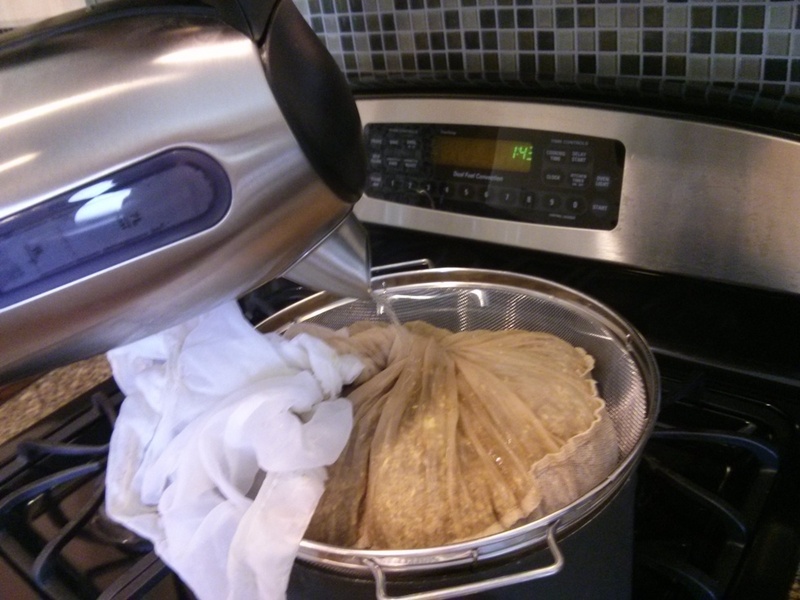 Slowly pour the heated 170F water across the top of the grain bag making sure to cover the entire surface. 4. At this point you should have just a little more than a gallon of wort (if you want to be sure make a measuring stick or cut a mark in spoon to denote a gallon). Raise the temperature to a boil and watch carefully for boil-overs until a low roiling boil is achieved and start your hop additions. 5. At the end of an hour check to make sure the volume of wort has not dipped significantly below the 1 gallon mark (add filtered water if it has). If you want to do so take a gravity reading with your hydrometer with a 50% solution of cooled wort and 50% filtered water. 6. Partially fill a sink with water and ice. Stir the wort one last time and add roughly 2/3rds of the chilled 1 gallon jug of spring water to the wort. Immediately cover and set the into the ice bath. 7. Put the sealed 1/3 gal of spring water back in the freezer to keep it cold. 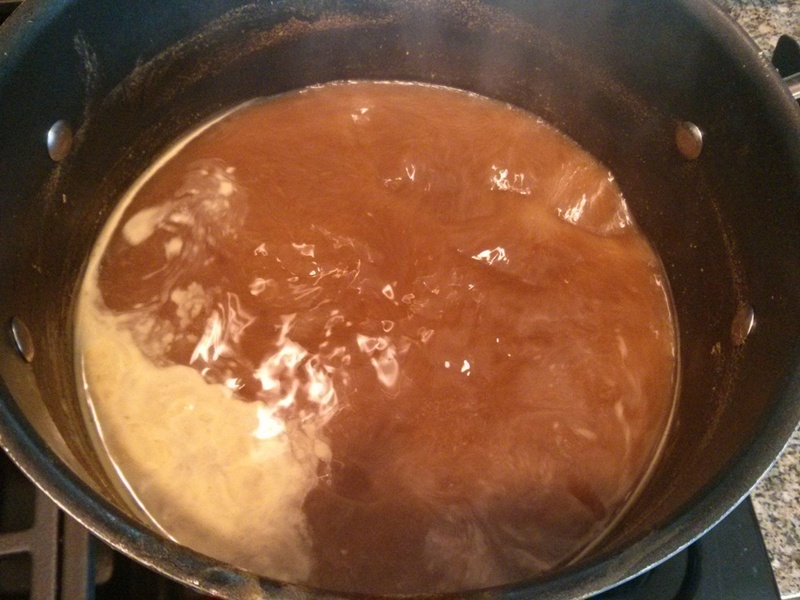 Allow the wort 5 to 10 minutes to cool and for the trub to settle. 8. Add the remaining chilled springwater (2/3 gal) into your fermenter. Transfer wort into fermenter using a sterilized siphon (a thermometer strip on your fermenter is useful to insure your wort is now below 72F). In most instances using this method wort will be below 70F within 10 minutes of finishing your boil and hence ready for pitching yeast. 9. 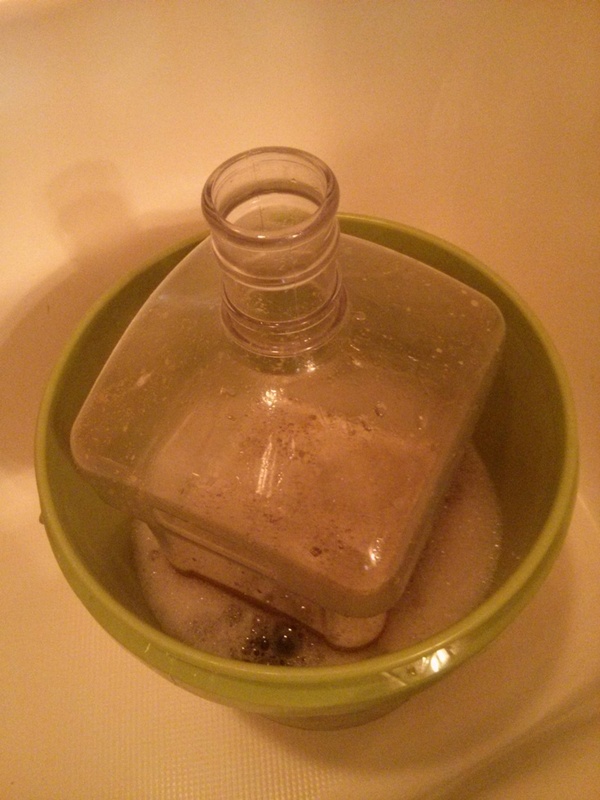 Add yeast (no need for a starter in most cases given the small volume). Many people utilize fermentation chambers and some homebrewers have chilling systems (including glycol re-circulation like the big boys), but if you have a room that is normally around 70-72F the temperature can be lowered a few degrees by putting the fermenter in standing water (to get down another couple degrees direct a small fan at it). In this case the two methods lowered the temperature in the fermenter from roughly 70F to 66F. 10. Once fermentation is complete bottle or keg. Again, experiment and try your own shortcuts. 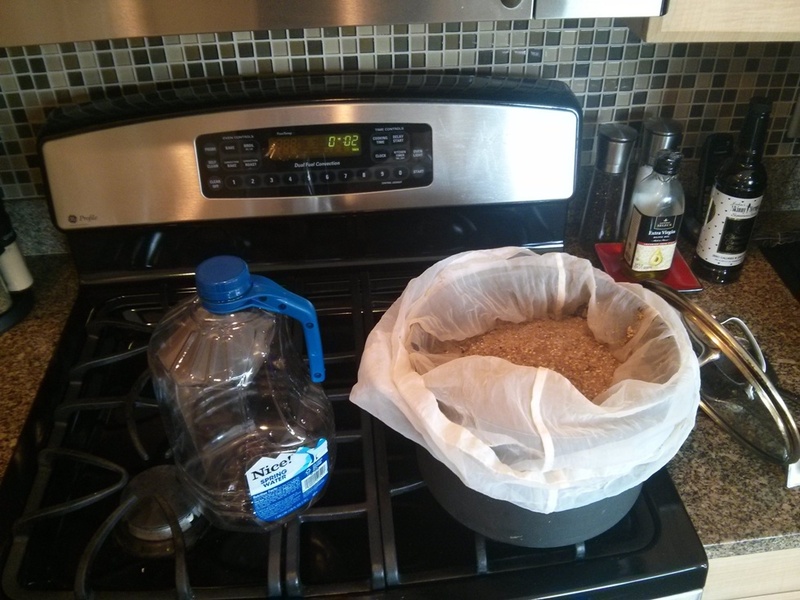 This is a quick, easy and rather foolproof method for making small all-grain batches with limited space. Total time from start to finish was less than 3 hours. The Church of Zymurology is fortunate to have two distinct homes. One is the lovely city of Austin, Texas and the other the equally beautiful town of Boulder, Colorado. During the three years in which we have ambled back and forth enjoying the local beer scene key differences became increasingly apparent. I covered variances between beer festivals in past posts, so this time I am focused only on the sociological variances I perceive on a very subjective level. Let’s start with Boulder, after all it does have the longest brewing tradition replete with pictures of Fred, Charlie and other “Craft” beer pioneers hanging on the wall at Boulder Beer Company. Boulder and its environs have at last count 37 breweries with many more in planning. While many are new, others such as Boulder Beer and Avery have been around for quite some time. Go North towards Fort Collins or 20 minutes Southeast to Denver and the number of breweries climbs to dizzying heights. Within this context it’s not surprising that people in Boulder and along the Front Range are not quite as excited about new breweries or the goings on at existing ones these days. Certainly, grand openings create buzz, but the market is starting to become saturated, if it is not already. After being in Boulder for over two months I have yet to visit all of the new breweries around us much less get back to some of our old favorites. The term “saturation” as applied to beer markets might be defined by some as the point at which some breweries close due to the sheer number of competitors, but for me it’s the point at which I can no longer keep up with new ones and also schedule trips to old ones I enjoy. As in Portland it seems with a plethora of commercial options many people that would otherwise try their hand at homebrewing simply don’t. There are a large number of commercial brewers in the area. You meet them at happy hours all over town or manning booths at beer festivals, but given their sheer number few if any are considered celebrities and most people in Boulder see little need to push their way through crowds in order to chat with them in order to bask in their greatness. The people that blog or write paid articles about the local beer scene are no less famous in local circles. They enjoy what they do and some make some money at it, while I am sure others do it in order to get into events. Still, those that cover the scene in the area are seemingly knowledgeable and not overly self aggrandizing. I have never seen any of them trying to curry favor with brewery reps or brewers in flagrant attempts at self promotion. On that note, let me turn my attention to Austin, Texas. I love the town and the people that I am fortunate to call my friends. I might be completely mistaken but I perceive ongoing changes in Austin that will at some point make it more like Boulder. Austin has a robust homebrewing scene that is directly related to what was for some time a very sparsely populated local commercial beer industry impacted by the downturn over ten years ago. That is changing however as breweries continue to pop up and new beers enter the market thanks to revised labeling mandates. Many homebrewers in the area have aspirations of opening their own breweries or brewpubs, while others enjoy competition. Still, there are some homebrewers that admit brewing less these days given the amount of quality commercial beer available. New breweries in Austin are improving, although the bar is still not set very high as compared to other mature beer producing states. 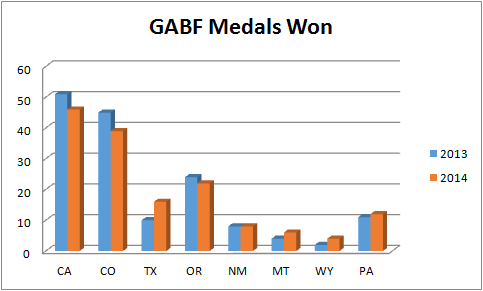 Whereas there are very few breweries in Boulder producing what some might subjectively label as “bad” beer (OK I can think of one), Austin still has a large proportionate number making substandard beer on an inconsistent (or more worrying a consistent) basis that would fare poorly in most homebrew competitions. One attribute about Austin that extends beyond the realm of beer involves the number of people that refrain from any negative commentary when it has to do with local businesses. From mediocre restaurants to horrible breweries, there are few that speak out and more often than not there are some that are happy to tell the business how wonderful they are, thereby doing a disservice to the business and everyone that walks through their doors. It is frustrating to watch the general public acting like brainless cheerleaders and it is even more maddening when so called “authorities” do the same. 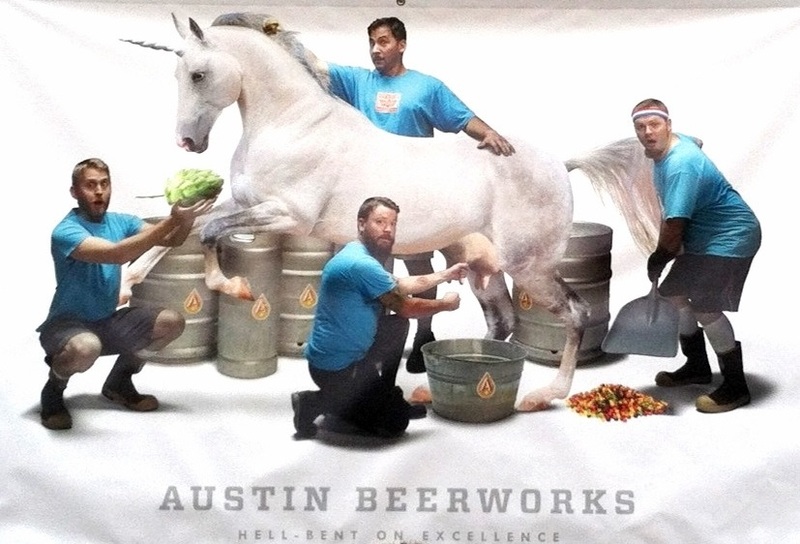 Austin is full of beer “authorities”, many of whom know little to nothing about how beer is made much less anything more substantive. I remember an incident at the GABF one year in which a group of Austin area bloggers that obtained media passes sat in the press room looking over a list of breweries in attendance. One asked another whether 512 was any “good” and the other said they “thought they were.” Yes, self promotion in Austin can get you far regardless of what you know. 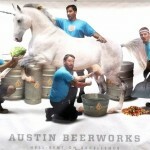 Similarly, the somewhat insular and nascent Austin beer scene seems to foster the notion that brewers are celebrities. I am lucky to count some of the brewers in Austin as friends and I value them as people I enjoy talking to, but they aren’t celebrities to me. I don’t seek people out because I want to bask in their glow or because I want something from them, I talk to them to find out who they are and sometimes to ask questions about their business. It would be difficult to count the number of times self promoting types have rushed in to get the attention of people they deem to be beer celebrities in order to interject something about themselves. In Austin this type of self aggrandizing “networking” is all too common, although in three years I have never witnessed it happening in Denver or Boulder (except perhaps during GABF when people from other states surround celebrity brewers like a pack of laughing wild hyenas). Before concluding I should also admit other cities such as Houston are similar to Austin in some ways due in part to the same dynamics. The good news from my standpoint is that Austin will likely be among the first to undergo fundamental changes in the years to come that will make it more like mature beer markets such as Denver and Boulder. Hopefully more and more breweries open saturating the market and employing a large number of brewers. At some point the majority of area breweries will be judged on the product they make by a public that can make their own decisions without reading the latest “Top Ten Austin Beers to Drink this Fall” article pushed out by the latest celebrity “expert”. With the demise of celebrity self promotion will also hopefully decline…although I am sure those with the propensity will find another avenue. Bless me O fermented one for I have sinned. I have been remiss in my duties to post mundane banter in the internet. Instead I have sat idly by as others took up that mantel by creating tip ten lists or reviews of beers sent to them free of charge by breweries seeking the approval of “experts”. Today as I write we are making our way across the country to Madison Wisconsin where we shall make pilgrimage to the Great Taste of the Midwest. Along the way we stopped in Omaha to visit Nebraska Brewing. Preconceptions are always interesting as its location in an upscale shopping center surprised me for some reason. We did learn they have just opened a larger facility nearby in a warehouse strip that looked very large in the blueprints we were shown. They maintain a 10 bbl brew house at their original location but have installed a 30 bbl one at the new one. In addition they have several rows of 120 bbl fermenter and a barrel room large enough for 450 barrels. There core offerings were solid and included a nice English style brown as well as an American IPA. They had several bottles of the barrel aged variety available to consume there or to take with you. We opted for a bottle of Black Betty, their barrel aged Imperial Stout, a most excellent elixir. Next stop Madison. 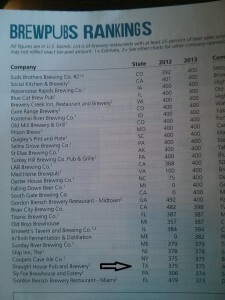 In the most recent edition of The New Brewer published by the Brewers Association they rank microbreweries and brewpubs by capacity and draw conclusions about the growth of the industry using the statistics. Its an admirable endeavor, but quantitative analysis is only as good as the data you generate to come to conclusions – in other words garbage in, garbage out. 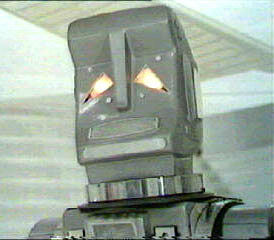 From what I understand the BA sends out surveys every year and relies on the responses to generate data. While this is an easy route to take, it leaves open the very real possibility for errors that then bring in to question the overall accuracy of everything they subsequently present. This is going to become an even more daunting task as new breweries open and old breweries expand, but perhaps they should hire some telemarketers to call around in an attempt to at least verify their assumptions are correct. I thought of this as I perused the most recent issue and noticed that the Draughthouse in Austin, Texas was listed as having produced 375 barrels of beer in 2013 – despite the fact that they sold off all of their equipment and did not brew a single drop last year (they do intend to brew this year once a new system is installed late this summer). 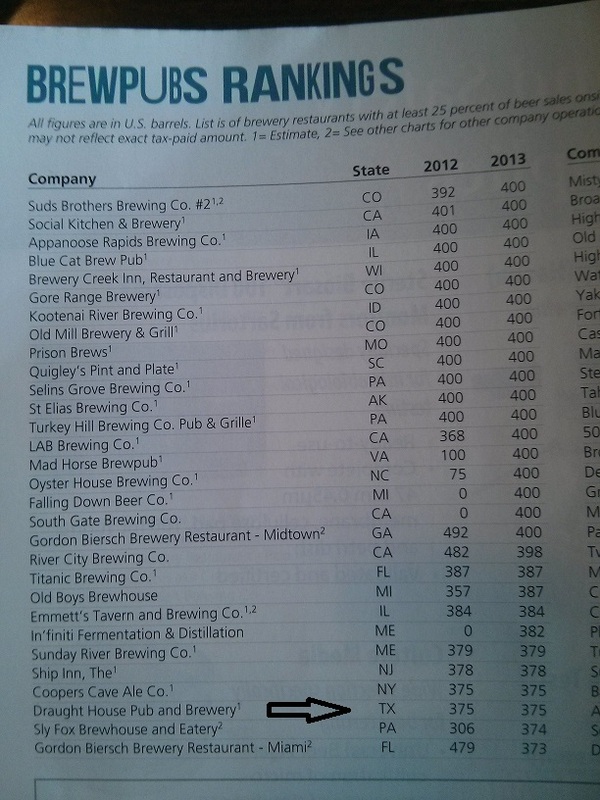 Also note there is along list of breweries that refuse to comment at the end of all the tables. Data is then used to create info graphics showing the rise of craft beer in each category. Draughthouse miraculously makes beer without equipment according to the BA.